Beautiful photo frame, embellishment decorating your home. 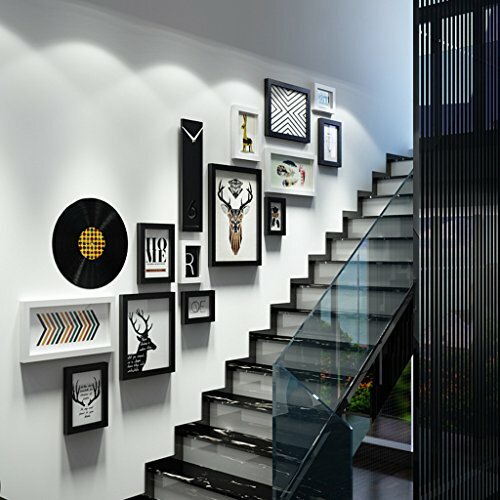 Only photo frames are included, and other decorations in the image are not included. The pursuit of the best personality products. This package contains only this product, not including any decorative items involved in the picture. Material: Plastic board + plastic. Set includes: 13 frames, 2 wall decorations. Inner Frame Dimensions: 8.7 * 12.3cm (5), 12.3 * 17.4cm (4), 19.9 * 24.9cm (2), 24.8 * 34.8cm (1), 14.8 * 29.8cm Cm function), long black watch 40 * 10 * 0.8cm (1). Total area of photo wall: 163x131 cm (64 * 51.5 inches).